Nordkalk Enrich products for coatings and adhesives combine superior quality with cost-efficiency and environmental benefits. The product portfolio is now expanded by Nordkalk Enrich C dry powder product, giving an alternative to dispersion Enrich C 50. 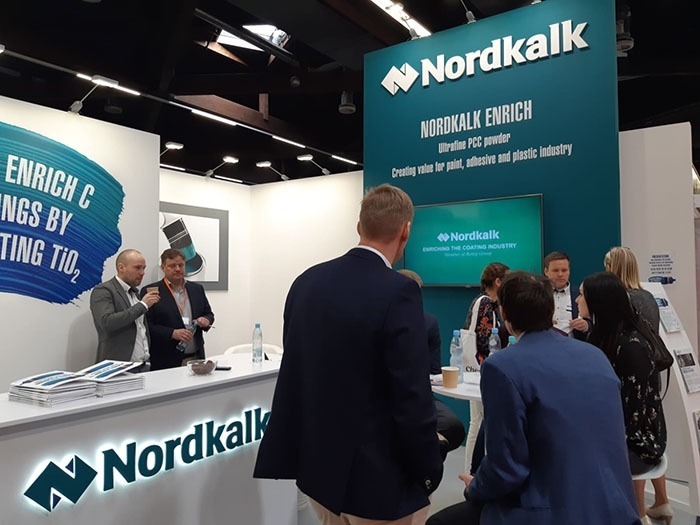 Nordkalk launches the dry product at the European Coatings Show in Nürnberg in Germany. With the assistance of Nordkalk Enrich, the need for titanium dioxide (TiO2) and binder is partially eliminated. This contributes to lower raw material costs while maintaining the technical performance of the paint on high level, for example gloss and wet-scrub resistance. With its clear edge over the pigment extenders on the market, Enrich is composed of homogenous ultrafine (d50 ~130 nm) particles. The customised ultrafine particles are smaller than titanium dioxide, preventing pigment particles from agglomerating. Enrich particles tend to enter the voids in the paint mixture, creating more efficient TiO2 spacing effect. In addition, the particles fill the paint surface, which intensifies its light reflection, achieving a distinct gloss improvement. Nordkalk Enrich is also an ecological choice for coping with more stringent environmental objectives and advancing carbon footprint reduction. Production of Nordkalk Enrich represents maximum 20 percent of the carbon footprint created by production of TiO2. The Enrich product portfolio offers products for other applications as well. Dry powder Enrich A and dispersion Enrich A 50 are tailored for adhesive applications providing mechanical properties such as adhesion and tensile strength and good dispersion stability. Enrich P brings numerous new development opportunities for the paper and packaging industries. With production in more than 20 locations in the Baltic Sea area, Central Europe, Norway and Turkey, we are always near our customers. The company employs 1000 people, and in 2018 its turnover amounted to EUR 300.1 million. Nordkalk is owned by Rettig Group.